We could all do with a treat now and then. After some recent tough times at the gym I need to put behind me, my muscles around my newly operated on knee are slowly but surely growing. Cinabar has somehow managed to wangle me a Cadbury's White Chocolate Creme Egg. I don't know how… mainly because I'm just an unpaid lackey, however it does pay off on the odd occasion. This White Chocolate Creme Egg is my pay off. She's probably thinking it'll keep me happy for a while. She's probably right! This is one of those prize eggs that people have been attacking regular Cadbury's Milk Chocolate Creme Eggs in stores to win big bucks from. People are even selling them unwrapped on Ebay. Yuck, probably with sticky finger marks all over them for free! It's funny that you don't have to unwrap them to find they are white chocolate, as they have it written in the ingredients on the wrapper. On unwrapping the White Chocolate Creme Egg Cinabar was all over me with a camera! "The Readers will want to see it," she exclaimed. "How do you eat your's? With a ruddy great lens stuck up your nose!" I replied grumpily. 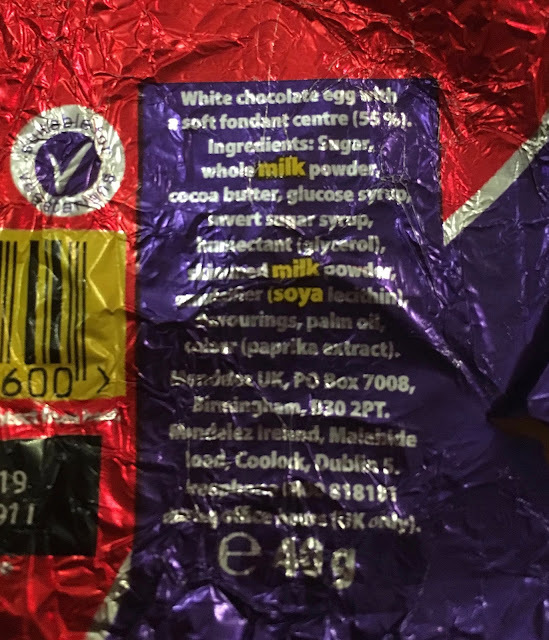 As you can see from the photograph, the White Chocolate Creme Egg is indeed white chocolate on the outside. 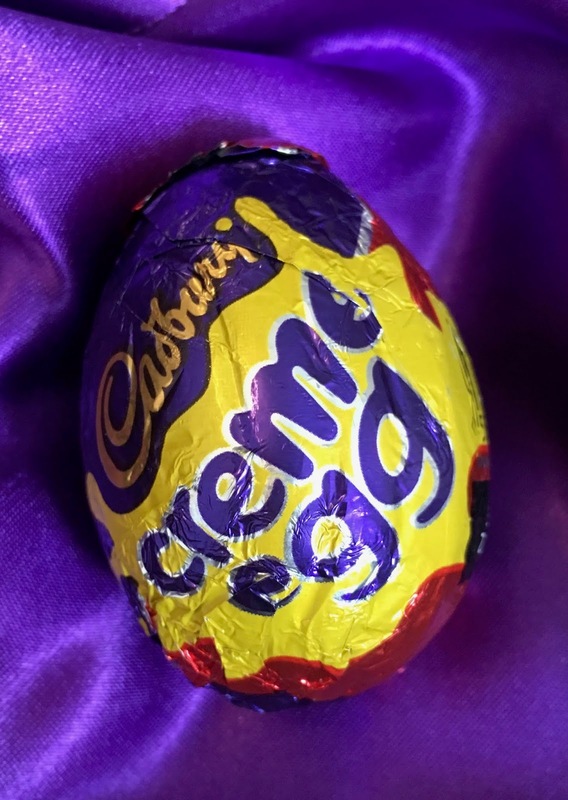 It has the traditional Cadbury's Creme Egg filling. It bizarrely tastes completely different to the milk chocolate variety. So bizarre it's not even like a distant cousin twice removed! 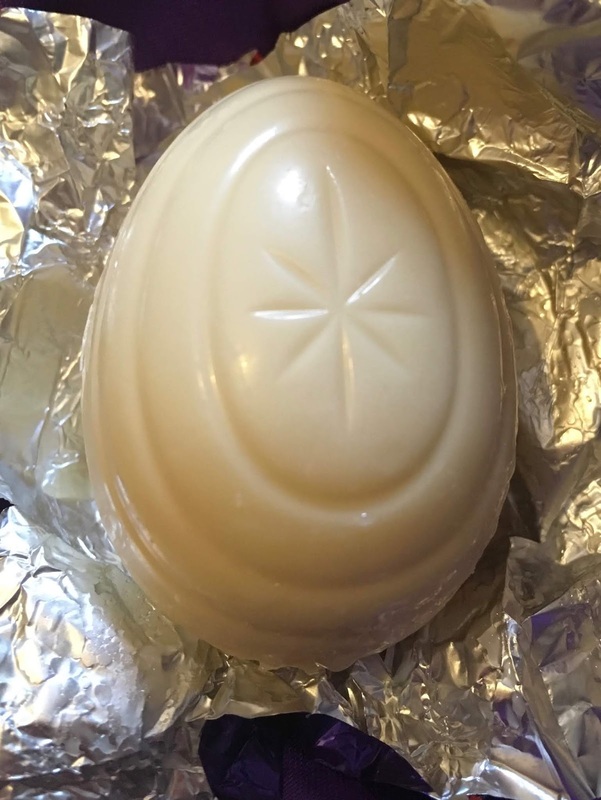 Sure it looks like a White Chocolate Creme Egg, but the sheer creaminess from the white chocolate coupled with the super sweetness from the egg's innards tastes like nothing I've ever tasted before. It's actually sublime. Honestly it's one of the best things I've ever tasted. 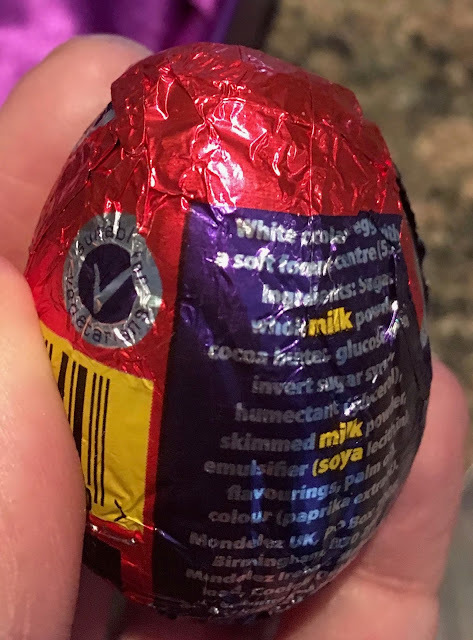 Unless they start making batches of these Cadbury's White Chocolate Creme Eggs then I strongly suspect this is the only one I'll ever eat. It was certainly timely and one heck of a treat for some of the stuff I've been through lately!